Looks gross cos we had to tapau cos they don't have tables. Opens from 6am and sells out by 8.30 am. These 2 packets cost slightly over RM 10 which is affordable since we took curry chicken, cockles, sotong and fried egg. We purposely stayed up til 6am to buy this then ate so much we just rolled over and slept wtf so unhealthy.. =x The basic one comes with vege, ikan bilis, peanuts, potato and halved hard boiled egg. 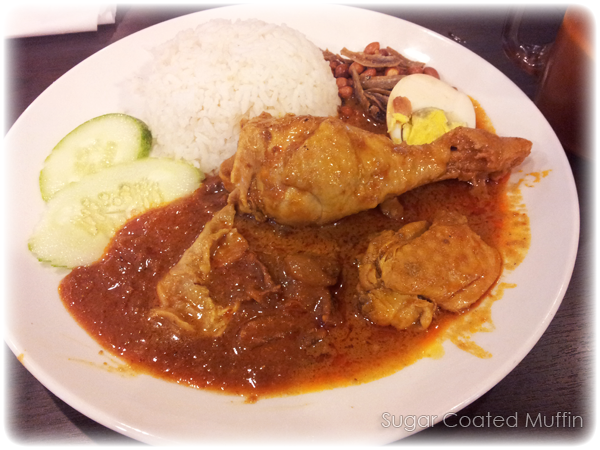 Curry is amazing but sambal is even better! Non stop crowd coming to buy and some even bring their own containers. 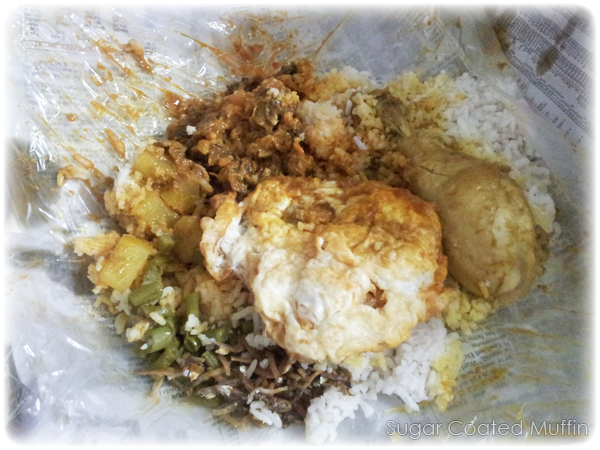 Actually I can't really see which is the sambal and which is the curry but they're both really yummy! 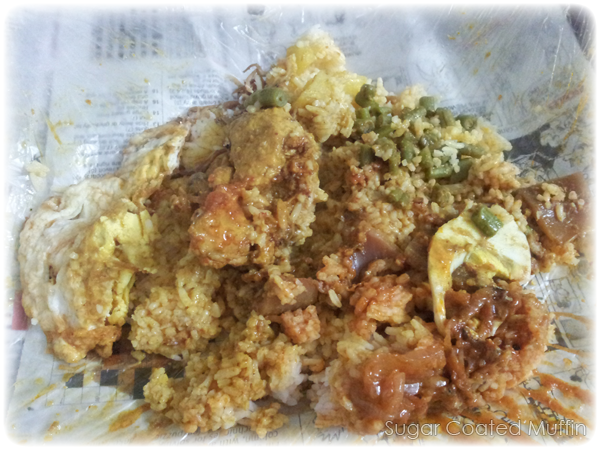 Chicken was really meaty (plus that lump on the bottom right is meat too) and the rice was fragrant. Needless to say, I finished everything =x Affordable for inside-mall food plus it comes with a drink. When myBurgerLab just opened, this was the landmark people used to direct their friends there. But I guess it's the other way round now. It's down the road (or rather up since it's uphill) from mBL. The chef throws your noodles high up in the air and catches it back without fail. I'm not sure if he caught any flying bugsies.. =x Tables are located along the dimly lit road and it can get pretty close to the passing cars. Also, the road is on a slope so be careful with your soups! 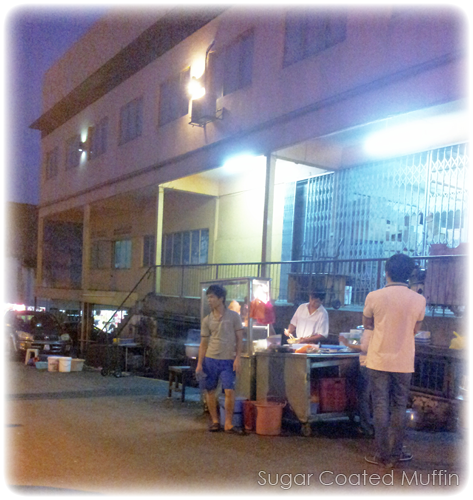 We came here of course, for the wantan mee which is not incredible but better than average. 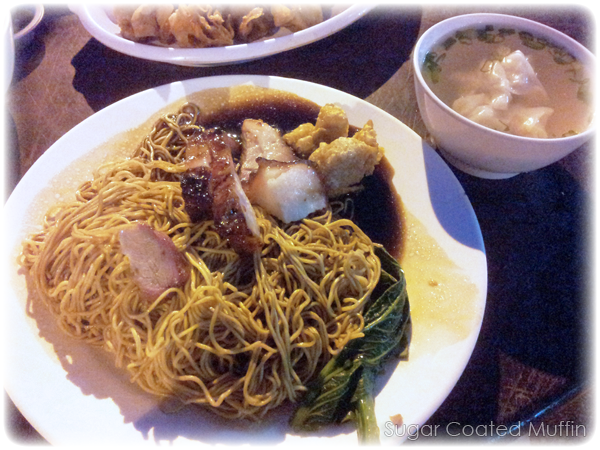 The mee didn't have that awful taste many have and the char siew wasn't too tough although very fatty. Included two sad leaves. Mee comes with a small bowl of dumplings in soup which were soft and juicy. 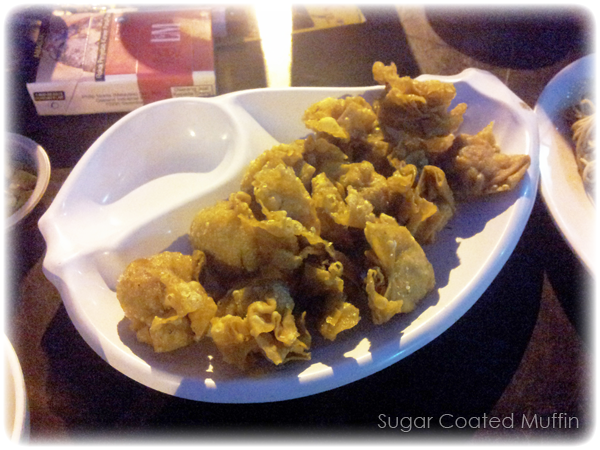 After tasting the 'sample' fried dumpling provided, we ordered an extra plate! It's quite tasty & crunchy although slightly too salty. Eating. Here. Again. Because the soup is just too good! Feels like I'm drinking homemade soup. 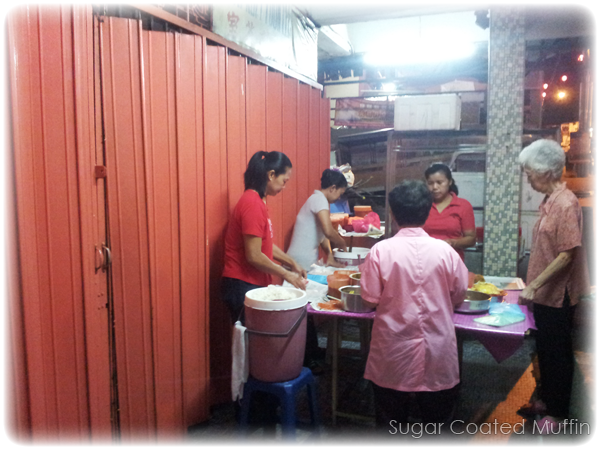 I was late that day as I arrived at 9 pm (I discovered that many of the soups were sold out by 7.30 pm! ). 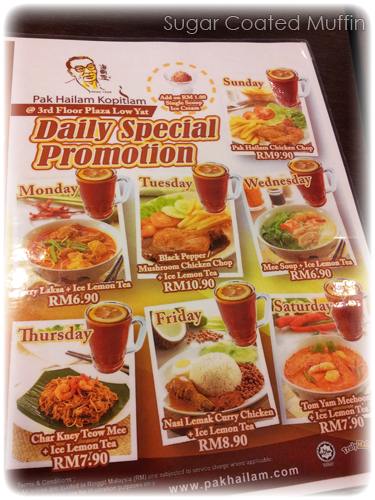 Thankfully, they still had this 'ham choi tong' which is a great appetite opener. I have this with rice alone. Although portion may seem small for a big eater, I feel it's alright since there are vegetables, tofu, tomatoes and really tasty & fragrant meat inside. 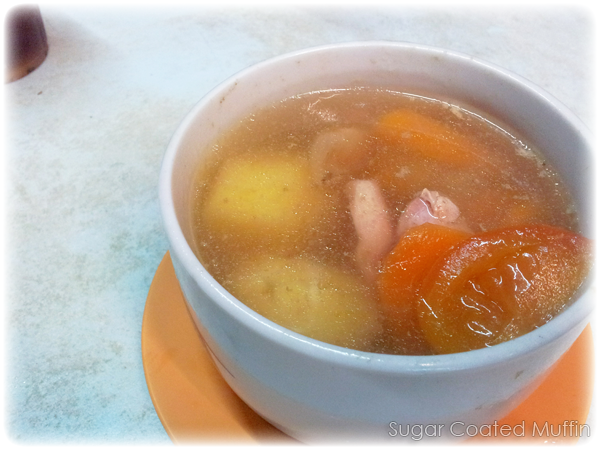 The warm sour and salty soup tastes great and has enough flavour to be eaten with rice. 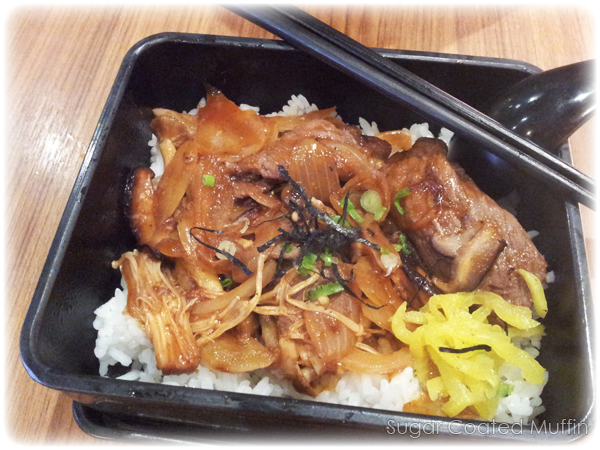 I had this at their Meng Tein branch as well but it was terribly salty! Like my dad would say, no ISO. 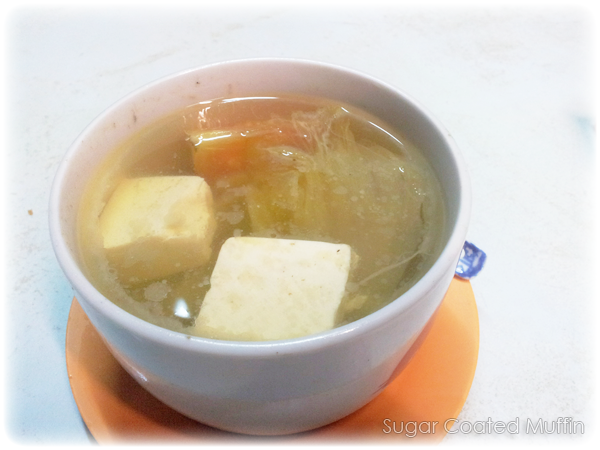 ABC soup does not contain Ajinomoto etc but the natural 'sweetness' of the soup is really good. You will find lots of potatoes, tomatoes and chunks of chicken meat (not dry) inside. 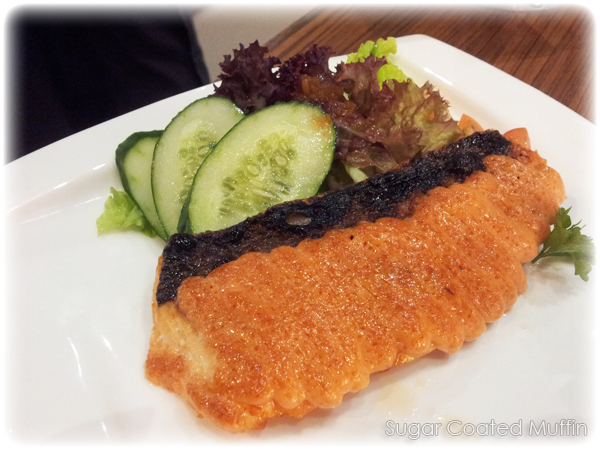 Salmon Mentai Yaki - This dish comes with a big slice of cooked salmon and salad on the side. The salmon is topped with mayo+roe sauce which was super yummy and creamy but not too thick or sickening. Unfortunately, the salmon was quite 'fishy' and the skin was so bitter. The mentai(ko?) sauce on top was not sufficient to cover the bad taste. The flesh of the fish wasn't too dry but I've had better ones elsewhere. The best part of this was definitely that EGG! It was perfectly timed to have a hardened exterior containing the half-boiled inside. I don't usually like egg yolk but this one had an amazing sweetness and it melted wonderfully in my mouth. Now I know why people love ramen eggs. Wish I could order the egg alone! Second would be the beef which was well marinated and not over cooked. It had sufficient flavour and was still juicy. Apart from that, I don't really fancy the rest of it. 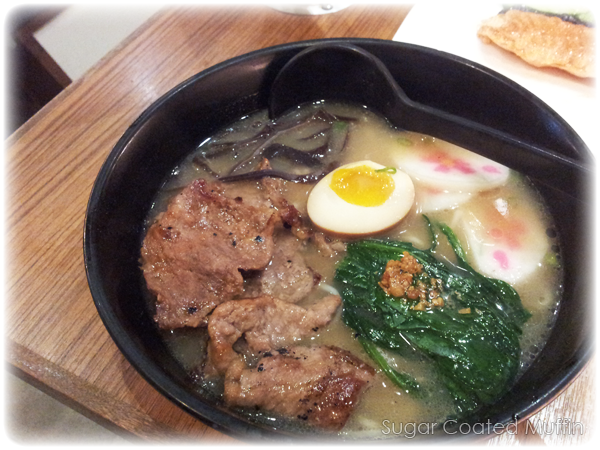 The ramen noodles were like overcooked Maggi mee which were so flimsy without any bounce. Soup wasn't spectacular and the leaves were just sad. Some kinda rice le bf ordered. Since I didn't try it, I can only comment that it was a really small portion. Du Viet @ KLCCBrought here by the lovely people at Marie France Bodyline so I can't really guarantee the accuracy of information. To the left is their Sugarcane Shrimp (Cha Tom) which is basically minced shrimp wrapped around a sweet and crunchy sugar cane then lightly deep fried. 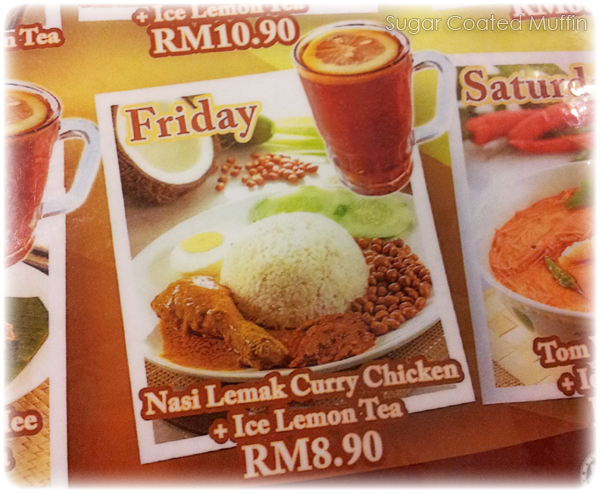 We enjoyed the combination of flavours here. 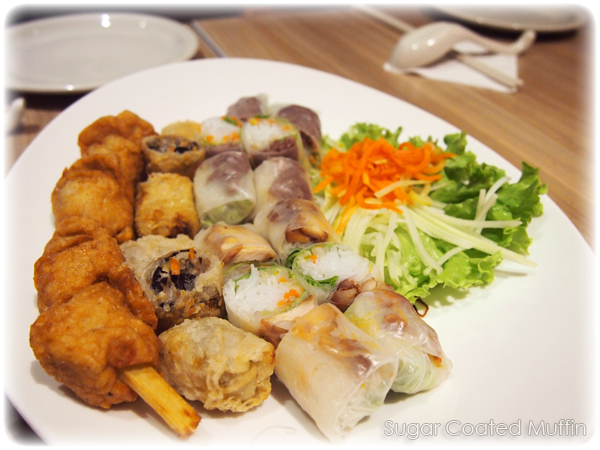 Next to them are some spring and summer rolls (Fried Springroll, Chicken & Beef Summer Rolls). Although I did not fancy the fried springrolls, the summer rolls were a different story. The contents were light and simple with a small piece of meat tucked away on one side and wrapped with that delicate 'popiah skin'. Comes with sweet & sour sauce to dip in. I quite like the mild taste with the meat even without the sauce. Plus they came in such small and cute sizes that are perfect. The salad (I believe apple salad) had us all munching away on it! 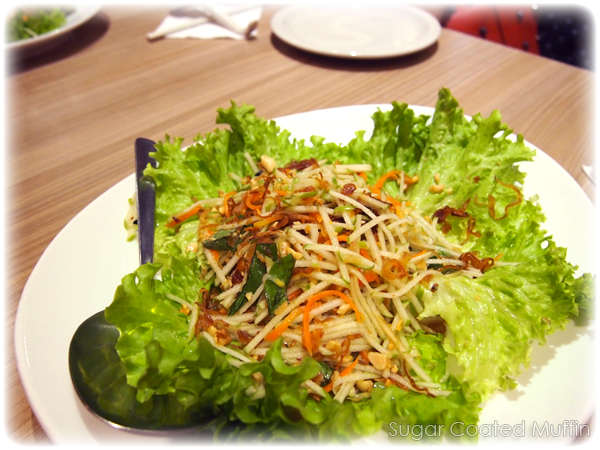 It was an assortment of green apple, carrots, peanuts and more, thinly sliced and tossed with a sour sauce. It was crunchy and refreshing. The sweet and sour taste opened our appetites and we cleaned the plate! 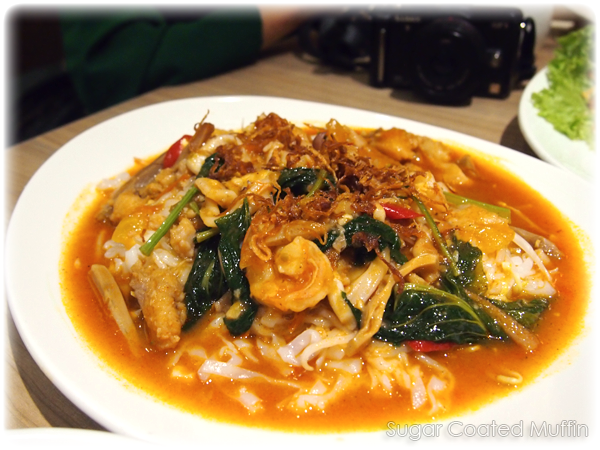 There isn't anything I don't like about this dish and I would recommend you to try it out! This dish was easily mistaken as a variety of things (I guessed oyster mushroom) but once I bit into it, I realized it was one of the best fried fish I've ever tasted! The flesh was so very soft and smooth. The sesame seeds it was fried with added some texture and crunch to it. 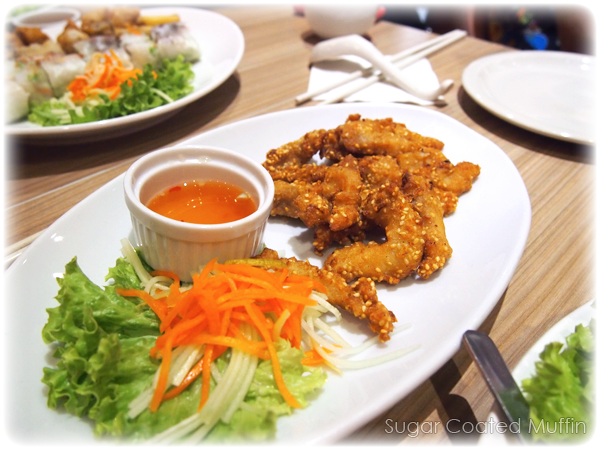 The provided sweet sauce added some flavour but I preferred the natural taste of the fish (it was fresh too). 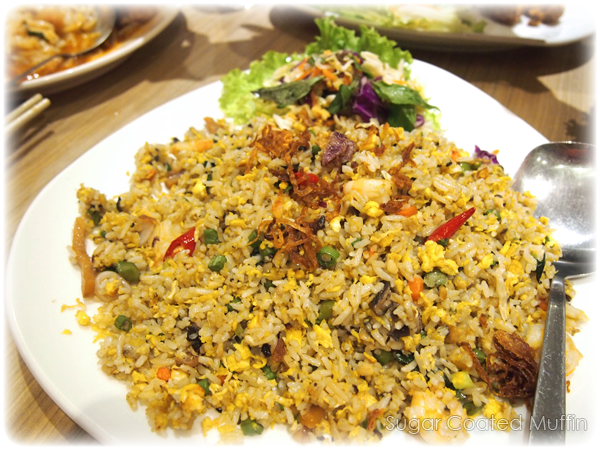 Possibly Vietnamese Fried Rice (Chicken, mushroom, shrimp, mixed veg & spice). I needed the carbs! Quite tasty and served as a tummy filler. In the end, I'm still thinking of that EGG! Btw, I heard Nadeje has officially opened at 3 Two Square so I guess that place won't be that dead anymore.. Thought of coming in to ask you how your session at Amante was but then looking at all these food pictures made me hungry again!